One of my biggest discomforts is that most energy professionals are experts on one energy source or on one aspect of the energy problem. We can all too easily get into a mode that is a variant of the old saying "if you have a hammer, everything looks like a nail." Whether you work on energy efficiency, solar, wind, nuclear, natural gas, or clean coal, you know what they can do and you tend to think that technology can solve all our energy problems. In reality, each of these is important, but each has applications where it excels, and other applications where it does not excel. Judging where each is best is a complex matter involving the nature of the demand, the location, and a variety of other factors. I'm not going to get into that here. The other important factor, though, is that our society and our economy, both domestic and world-wide, are demanding ever more from our energy sector. Therefore, the basic reality, in my view, is that we do not have a choice between efficiency or clean coal, between wind or nuclear power, between solar or natural gas. We are going to need them all. We are going to need them to meet energy needs in the United States. We are going to need them to meet the rapidly growing energy demands of the developing world. We are going to need them to assure that we reduce the amount of carbon we emit into the atmosphere. Too often, I have seen studies and reports that focus on just one technology or just one sector without addressing the big picture. If only we implemented all possible energy efficiency measures, we'd never have to do anything else. If we focused on building wind machines, we wouldn't need other sources of electricity. If we put solar collectors on every rooftop, we could do away with an electricity grid. OK, I am exaggerating what some proponents are saying about their technologies--but in some cases, I am not exaggerating very much. In truth, we all think our technology is a hammer, and we all think the energy problem is a nail. It is therefore refreshing to see the recent publication by the National Research Council, "America's Energy Future: Technology and Transformation." It clearly states the need to 1) deploy more existing energy-efficient technologies in the near term; 2) develop and deploy advanced renewable energy sources, nuclear power plants, and coal with carbon capture and storage; 3) expand and modernize the nation's electrical transmission and distribution systems; and 4) improve vehicle efficiency, develop technologies for the conversion of biomass and coal-to-liquid fuels, and expand deployment of plug-in hybrids, battery-powered electric vehicles, and hydrogen fuel-cell vehicles. It recommends more R&D in all these areas, and it notes the need to address policy and regulatory barriers (and incentives) as an integral part of the development effort. The report pulls no punches. It states that what we do in the next decade or so will set our course for many years to come. It acknowledges that the R&D will be expensive, and that some of the new technologies may cost more than what we have now. And it recognizes that not all research efforts will prove successful. Some research will not achieve its goals, some may be technical successes but economic failures, and some may be overtaken by other technologies. What is important to me is that it clearly states that the R&D in multiple areas has to be done in parallel. This is a tall order, especially in our present economic situation, but the alternative is chilling to contemplate (both figuratively, and perhaps literally). We simply cannot focus just on wind, then move on if it does not prove capable of meeting all our needs. We cannot optimize energy efficiency and assume we will need no new energy supplies. In fact, at least in the near term, we can't stop producing petroleum either. This is an important and thoughtful document, and represents the best combined thinking of many of the biggest leaders in the energy field in the United States. I recommend it highly. It should be required reading for everyone who works on energy matters. To start this blog, below are the titles and short descriptions of a series of essays I developed for Japan NUS (a technical consulting firm on energy and environmental systems) in 2008 and 2009 and links to the full essays. The essays are also available in Japanese. 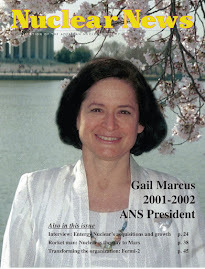 I should also add a note here to say that I was honored to be selected as the first guest editor to the "Global Energy Essays" of JANUS, and that I much enjoyed writing the series. In fact, in large part, that is what inspired me to start this blog. I recall Yogi Berra's famous sentiment, "It is hard to make predictions, especially about the future," and identify some of the problems we seemed not to anticipate in trying to introduce new technologies (for example, impacts of ethanol production on food prices and environmental problems in disposing of energy-efficient light bulbs). I note some of the ways society can approach the development of new energy technologies in ways that better protect us against possible negative impacts of new technologies that we cannot, or do not, anticipate. Prior to the election last year, it was clear that support for the proposed Yucca Mountain nuclear waste repository was crumbling. I summarized some of the history that led to the current predicament, contrasted it with the history of waste repository development in several other countries, and outlined some of the possible next steps in dealing with nuclear waste in the United States. This somewhat light-hearted approach uses a quote by a past NRC Chairman, Ivan Selin, that “in France, there are 365 kinds of cheese and one kind of reactor. In the United States, it’s the opposite” to discuss the practical consequences of that difference in approach. It also notes that Japan has an approach that falls somewhat between the two extremes, and notes the consequences of that. This essay reviews some of the successes and failures of the current Kyoto Protocol and proposes some issues that should be addressed in the discussions of an extension of the protocol. One issue covered is the treatment given to nuclear power in the current Kyoto Protocol. Another issue is the importance of engaging the developing world. This issue is currently the subject of discussion between the United States and India. This essay covers a topic of emerging importance in the nuclear industry--the preservation and transfer of accumulated knowledge and experience over time. The title is based on the parable of the blind men and the elephant, where the blind men all visualize the elephant in different ways, depending on where they touch it. Likewise, there seem to be different issues associated with knowledge development, depending on whether one is concerned about research results, operations, personnel turnover, etc. The essay covers some of the issues and some of the possible measures that can be taken. In this essay, which is the last of the series, I try to bring together a number of my observations on international issues developed over the course of my career. I try to summarize how international issues affect the nuclear community and to suggest some ways in which the nuclear community can deal with the international arena most effectively. I examine some of the current international collaborations and their roles, both in the safety area and in the development of advanced nuclear technologies. I also lay out some of the challenges I see ahead, both for countries that presently have nuclear power plants and for new entrants to the field.